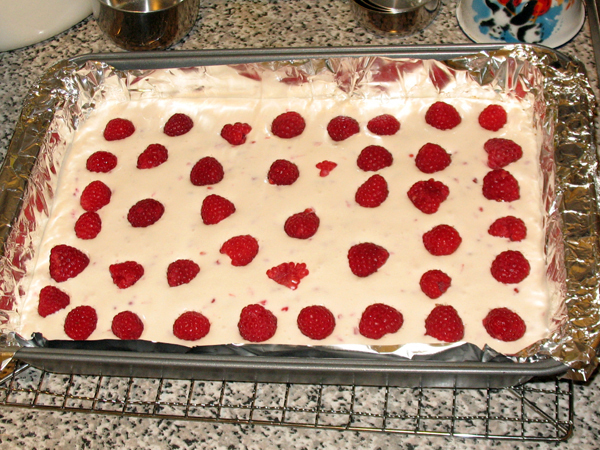 What’s tart and rich, and filled with raspberry goodness? 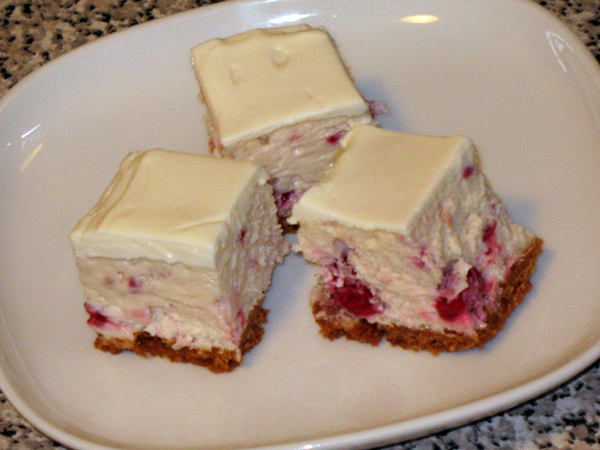 The other day my sister told me about raspberry cheesecake, and I could think of nothing else until I had some too. 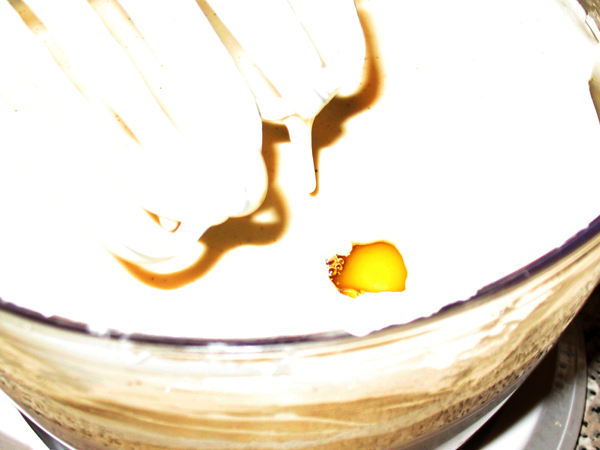 “It’s delicious,” she assured me, and I was eager to see for myself. I intended to add cream to this but forgot about it, and in the end I’m glad I didn’t, it would have been too much liquid combined with the juice from the berries. 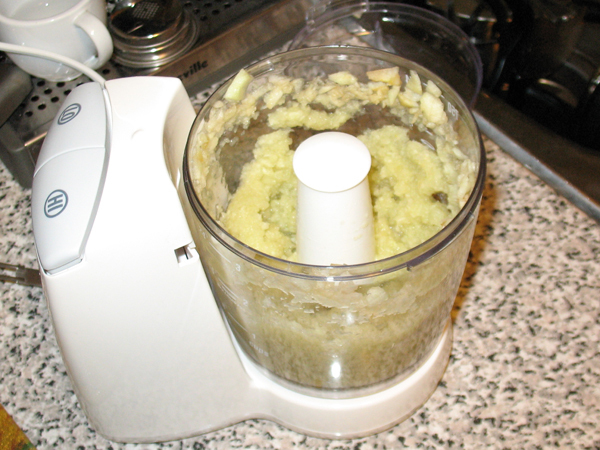 Recommend you don’t use frozen berries for the same reason. 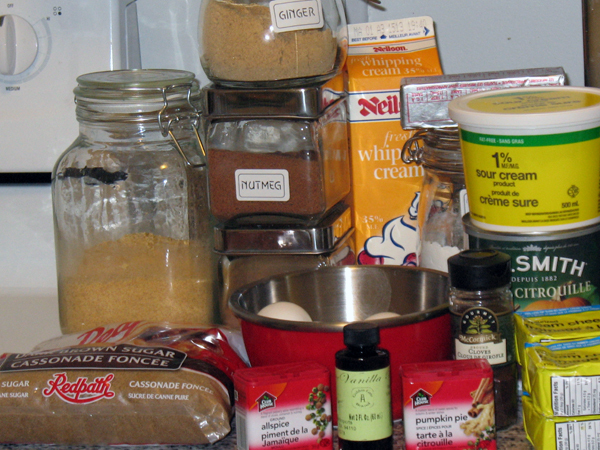 I was also going to crush the graham crackers but after I took this picture discovered I had just enough graham cracker crumbs in the pantry to use instead. Huzzah! 1. 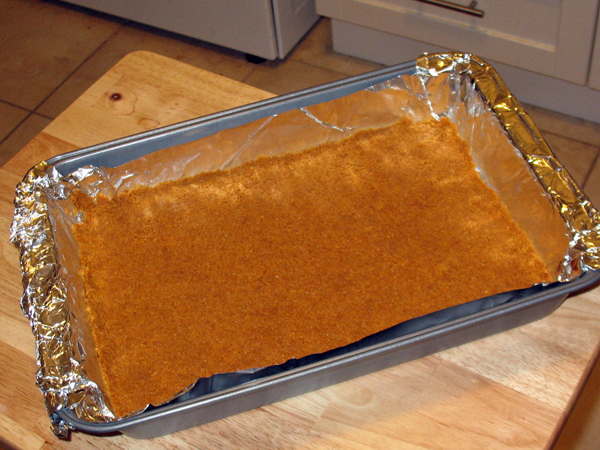 Using centre rack, preheat oven to 176°C / 350°F. Fill kettle and boil. 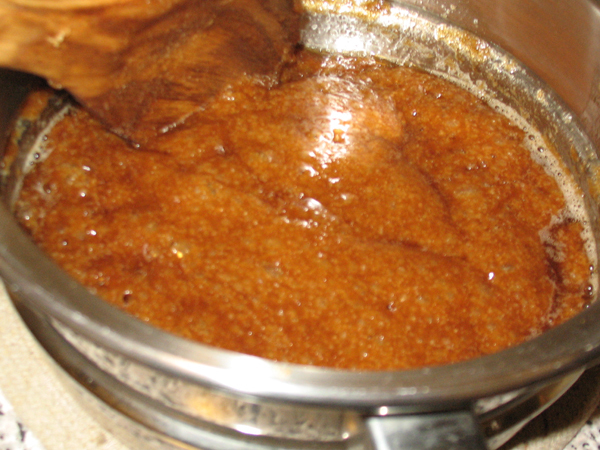 After water boils, leave on Low for use later. 2. 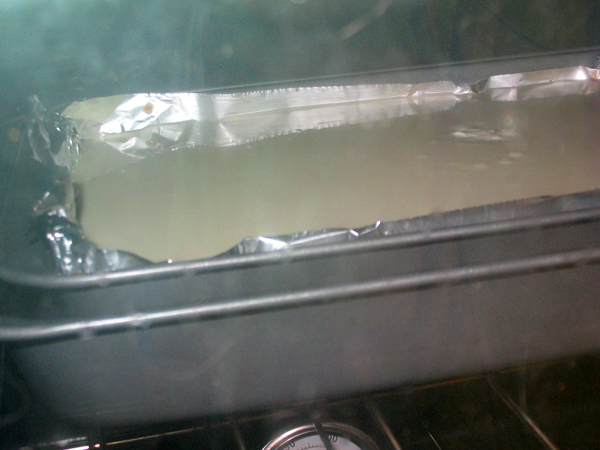 Line 9″ x 13″ baking pan with foil, and grease. 3. 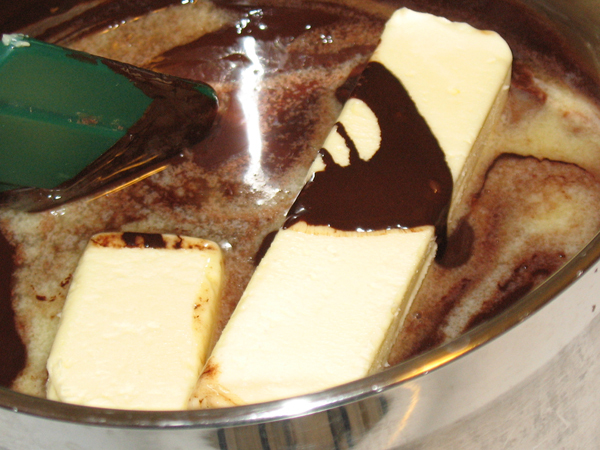 Melt butter in sauce pan on Low. 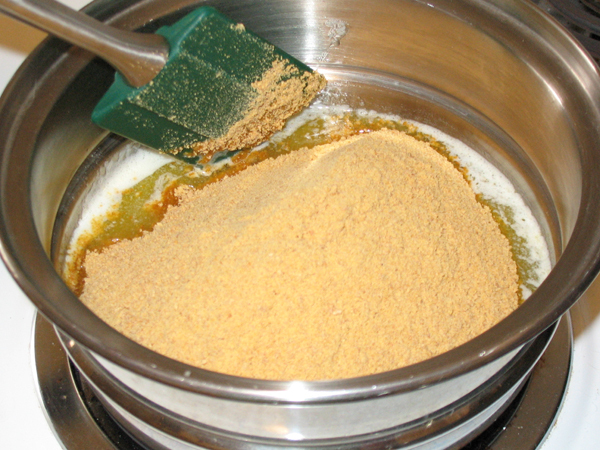 Remove from heat and stir in graham cracker crumbs. 4. 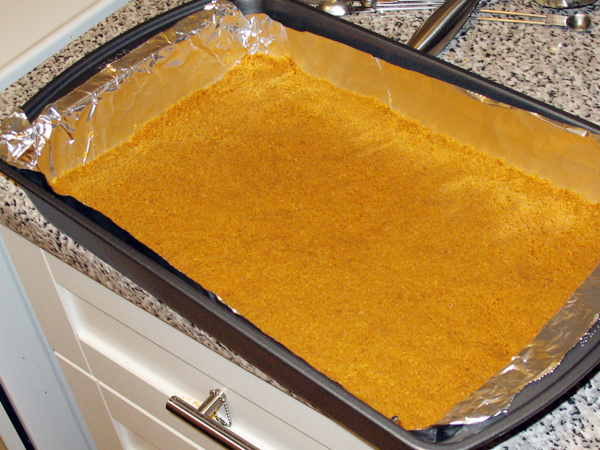 Pat crumbs into prepared pan. 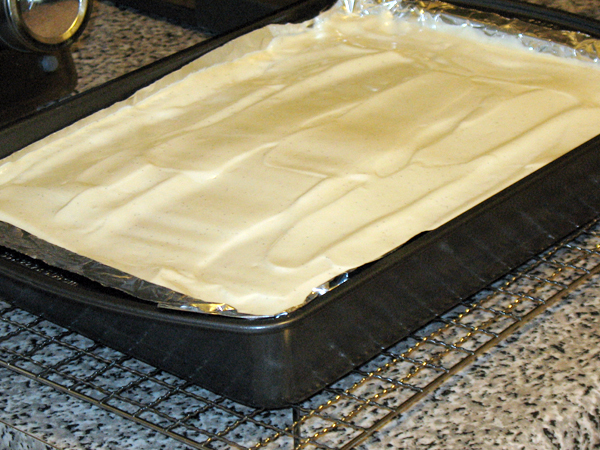 Bake 10 minutes and cool on wire rack. 5. Rise and dry berries. Sample! Set aside. 6. 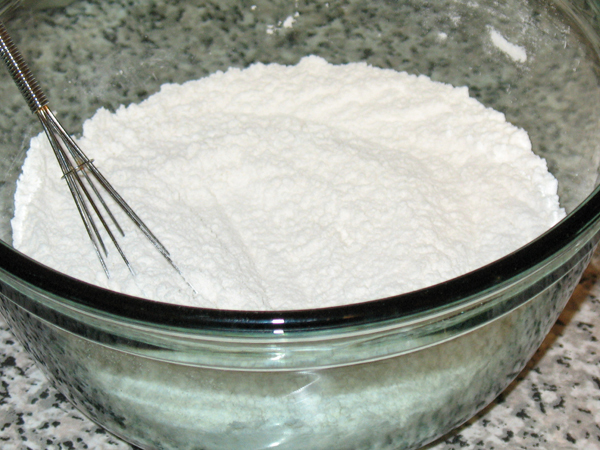 In a small bowl whisk sugar and cornstarch together, set aside. 7. 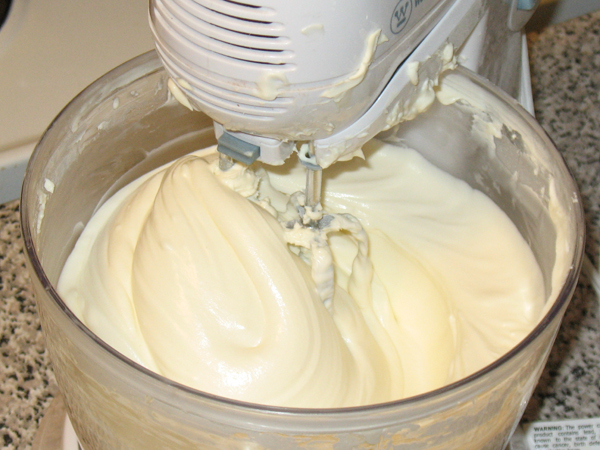 In mixer, on Medium speed, beat cream cheese for 5 minutes. 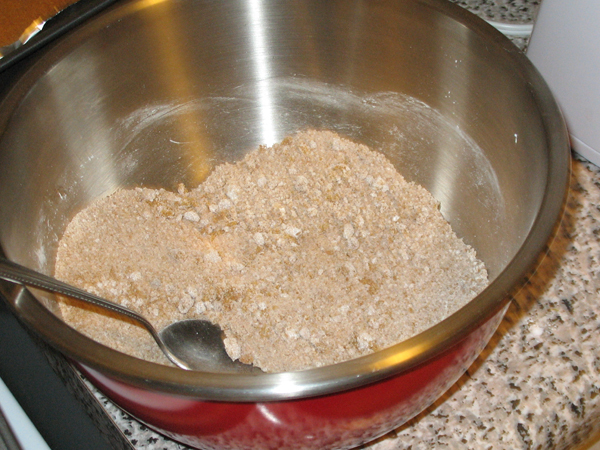 Use a spatula to scrape down the sides of the bowl every 60 seconds. 8. 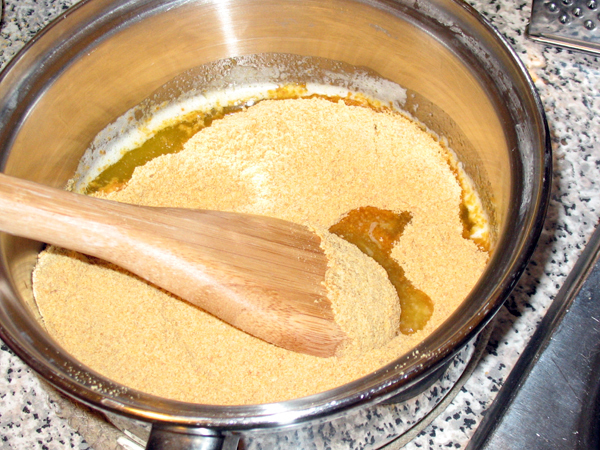 Gradually beat in sugar mixture, then add eggs one at a time. 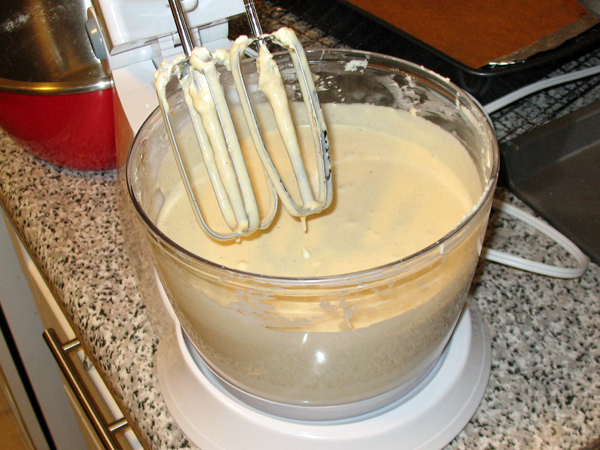 Mix until thoroughly blended, but don’t overbeat and remember to scrape down the sides. 9. 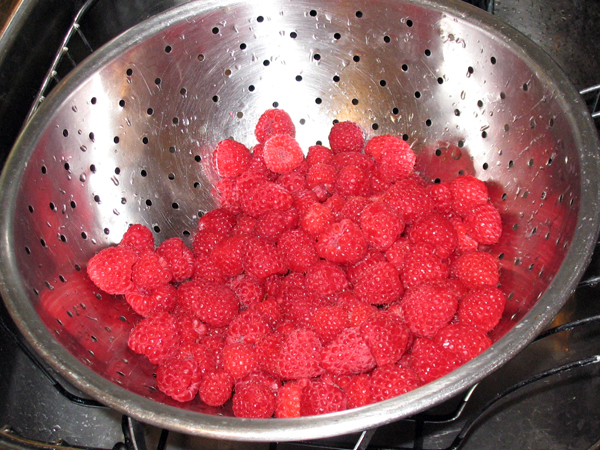 Add about half of the berries and beat on High until you see swirls of red. 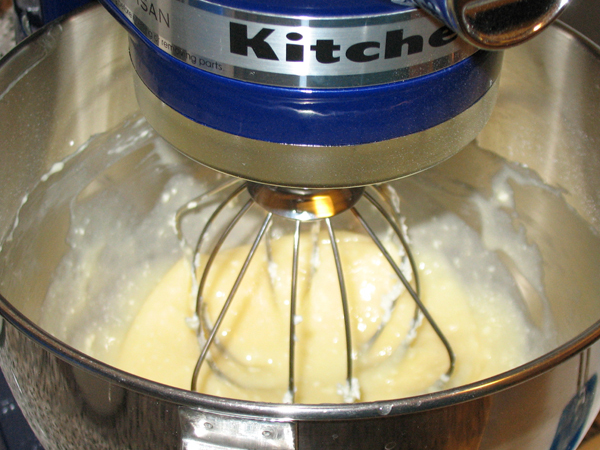 Dodge that stuff like The Matrix as you remember why putting a KitchenAid on the highest speed can be a bad idea. 10. 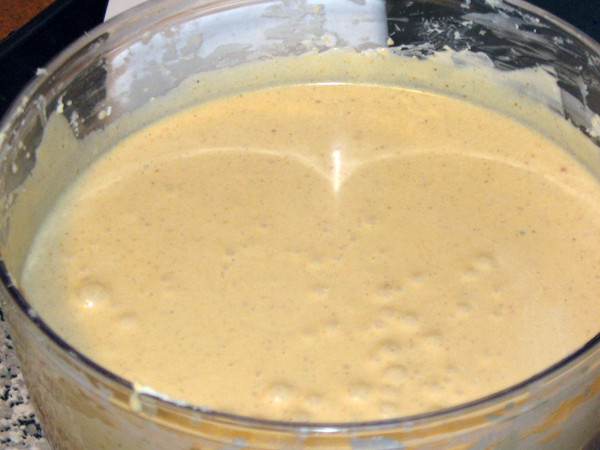 Pour half of the filling onto the crust. 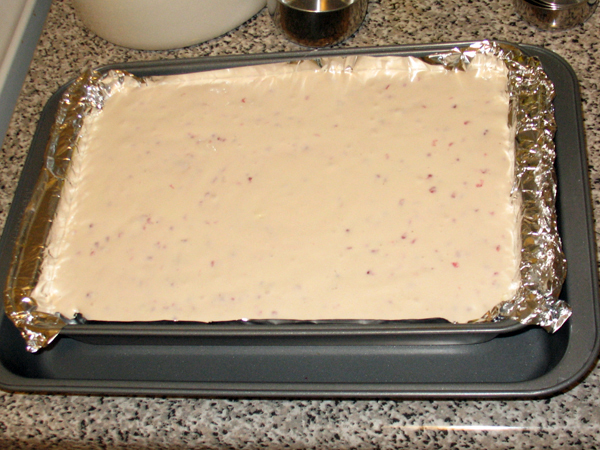 Sprinkle with remaining berries, then remaining filling. 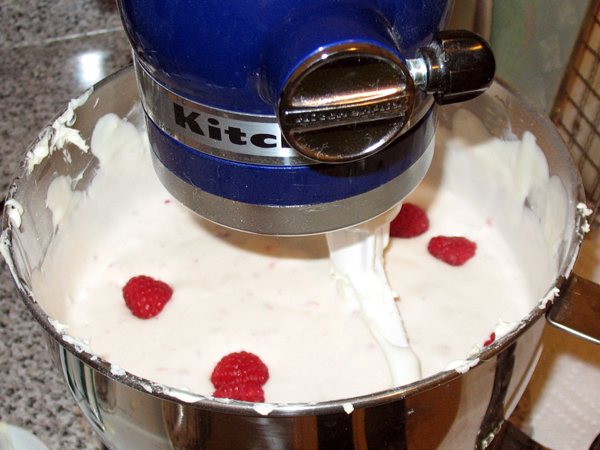 Get annoyed when your berries, which may or may not have been meticulously spaced, are displaced by the weigh of the rest of the filling as it is poured. Frown repeatedly. 11. 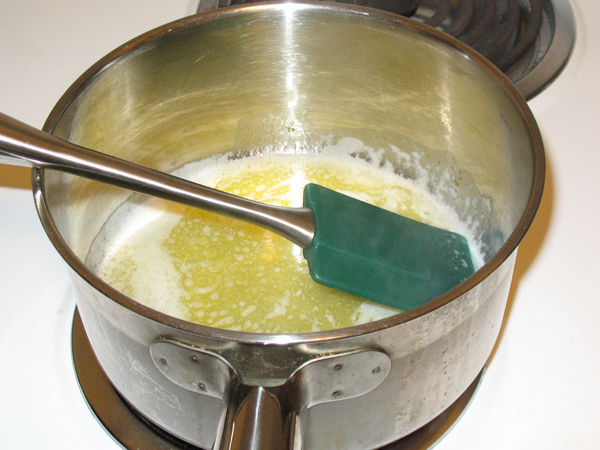 Create the hot water bath. 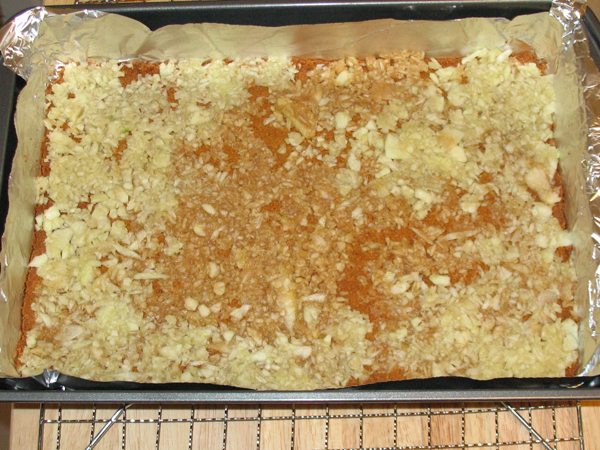 Bake 50 minutes until just centre jiggles, then remove from oven and place on rack (turn off oven). 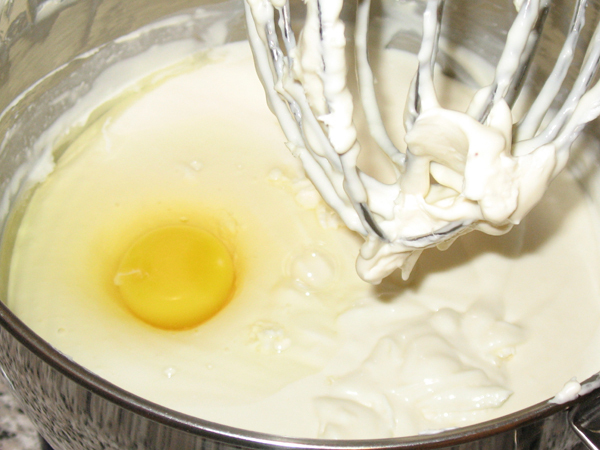 Flip out when you remember you forgot to add the heavy cream, and obsessively wonder what will happen when it’s time to slice it. 12. 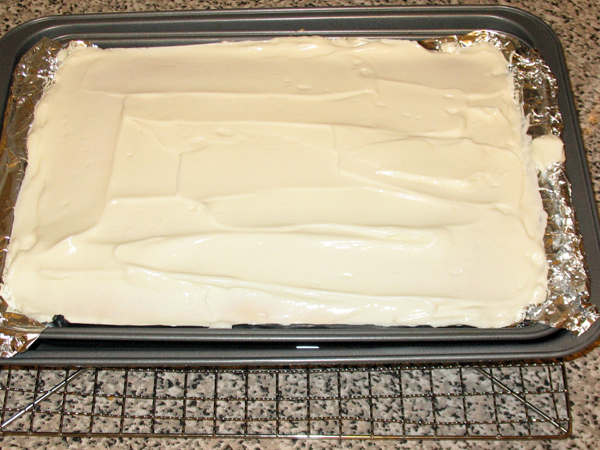 While the cake was baking I made up the topping, see small bowl to the right? 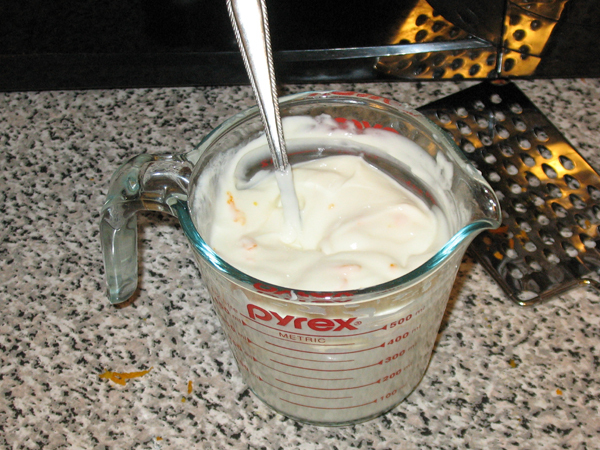 It’s just sour cream and white sugar mixed together. 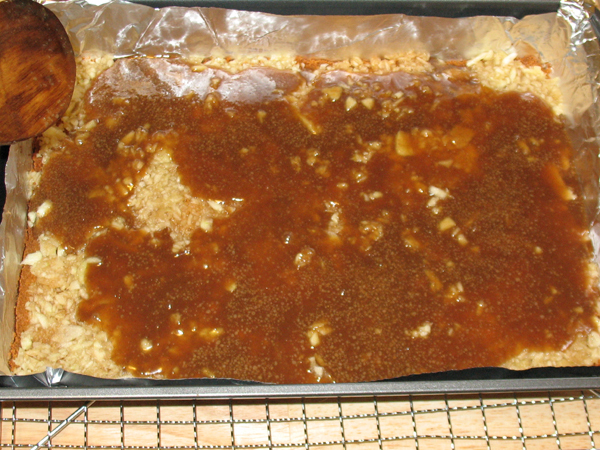 Chill it until the cake is removed from the oven, then spoon mixture onto hot cake, use soft spatula to spread it evenly, and return cake to oven for 5 minutes (oven is off). 14. 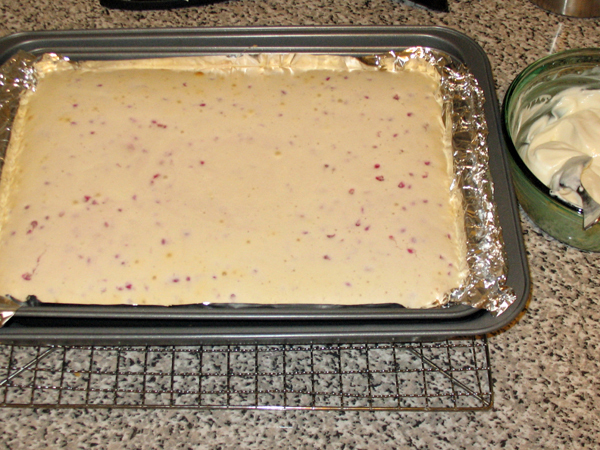 Remove from oven and carefully remove the smaller pan (which holds the cake) from the large pan. 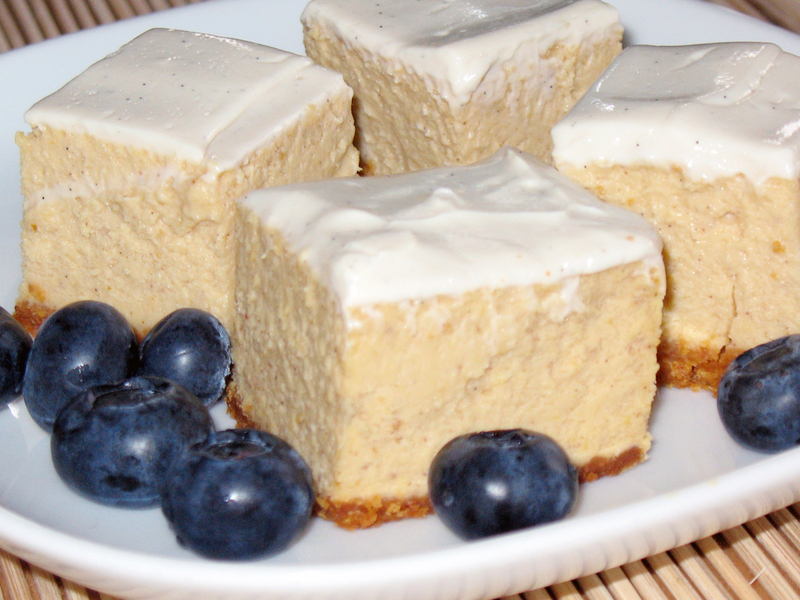 Cool cheesecake for at least 2 hours. 15. Cover in plastic wrap and chill overnight. 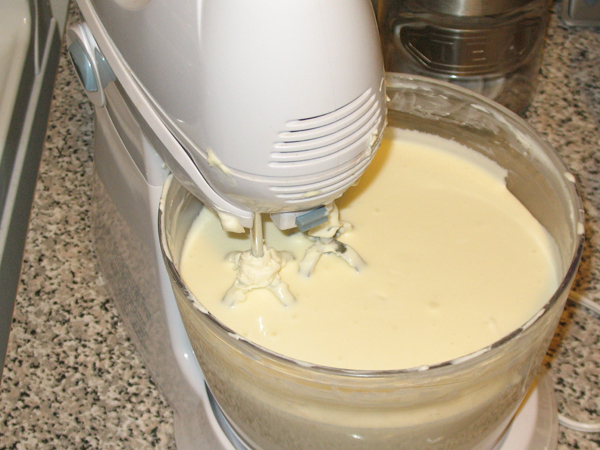 Is this your first time making a cheesecake? 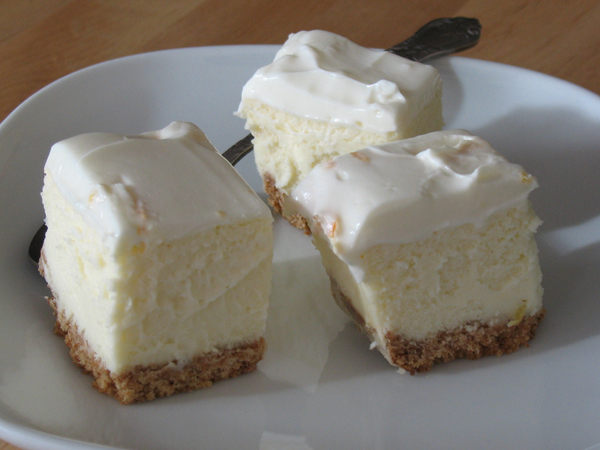 Read my notes on how to slice a cheesecake correctly. 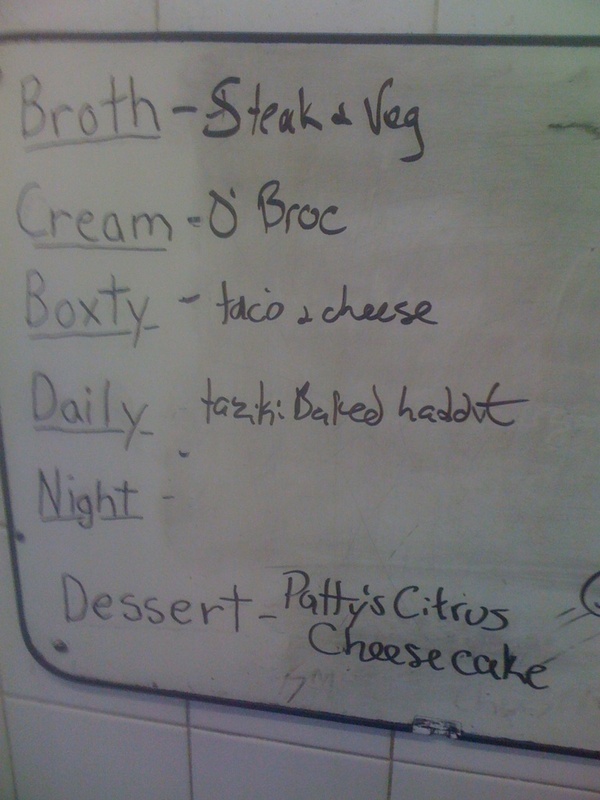 Verdict: Be still my stomach. 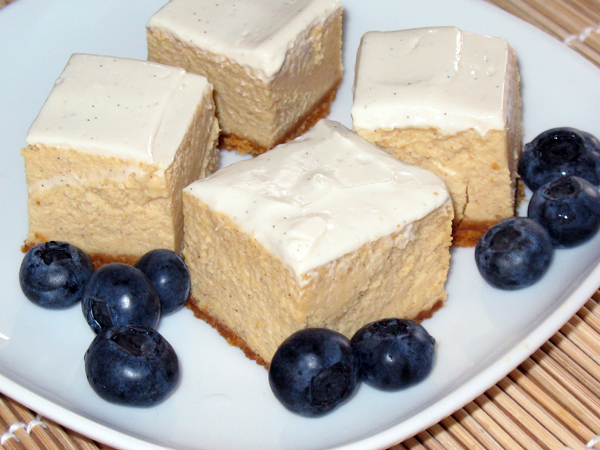 This is delicious, but cheesecake for breakfast has to stop. I am dying. 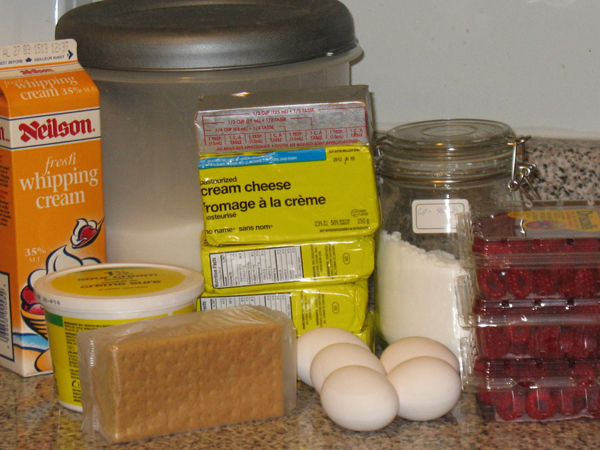 I plan to donate some of this to my partying neighbours across the hall. 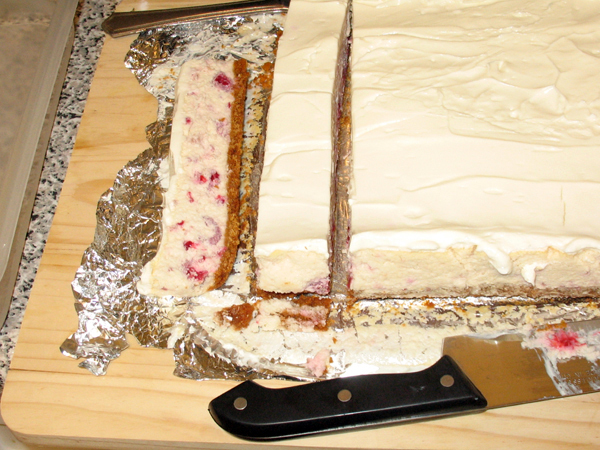 Ah, raspberry cheesecake is sumptuous. Thanks Chocoholic! This idea has been percolating in my brain for awhile. I like pumpkins. 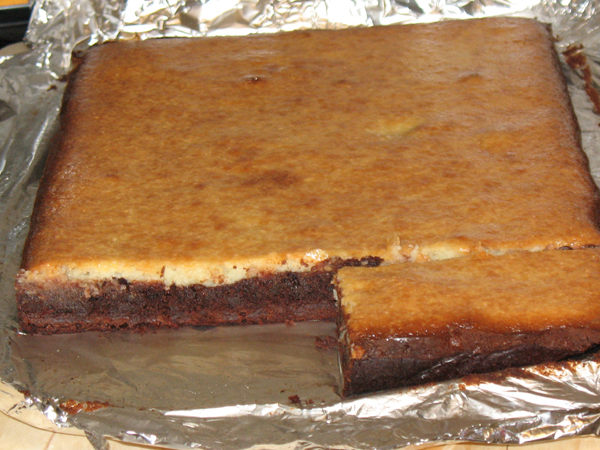 I like cheesecake. Could they combine into something cool like Voltron? Turns out yes, yes they can. 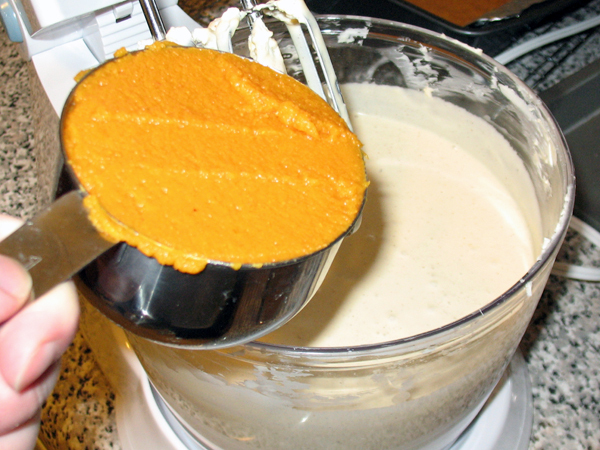 The pumpkin is a native squash of North America and harvested in autumn. Being Canadian and born in October, this pleases me greatly. How many other types of produce can be used as doorstops and in competitive sports? I’m dying to go pumpkin chucking now. 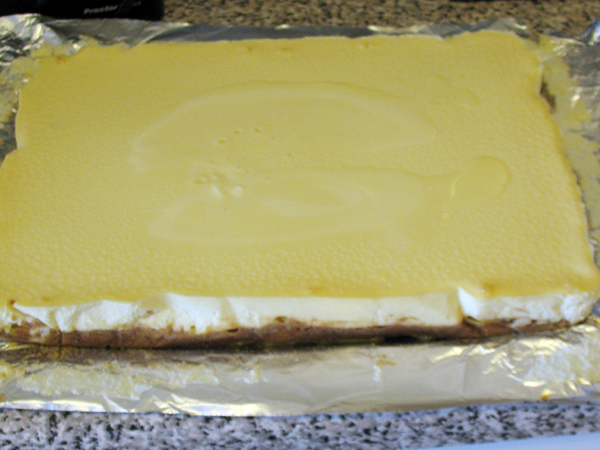 The proportions that I used yielded a cheesecake with a subtle flavour. 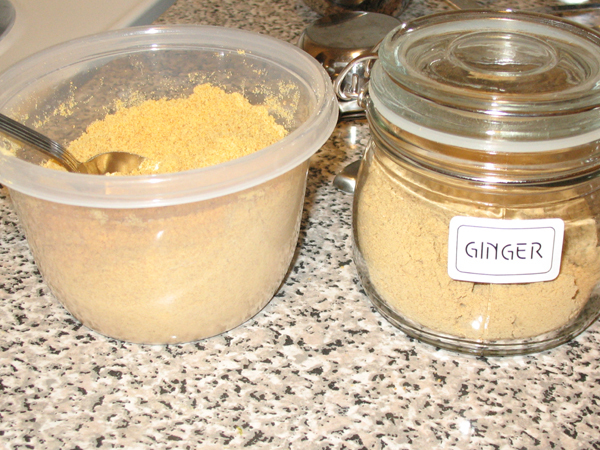 If you like the bold taste of pumpkin and want that punch-out flavour you’ll need to increase the amount of pumpkin and spices used. 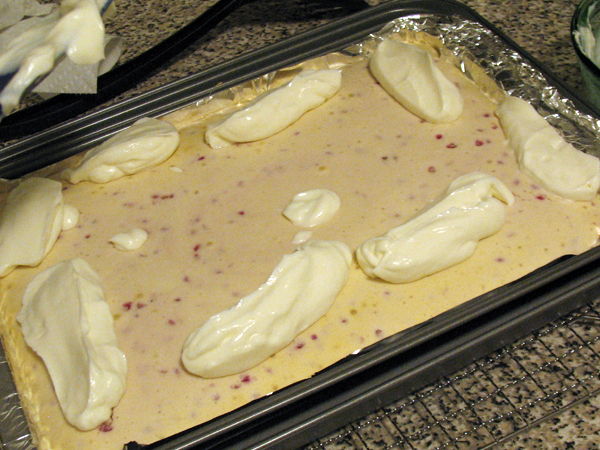 Let the cream cheese sit at room temperature for at least 2 hours. 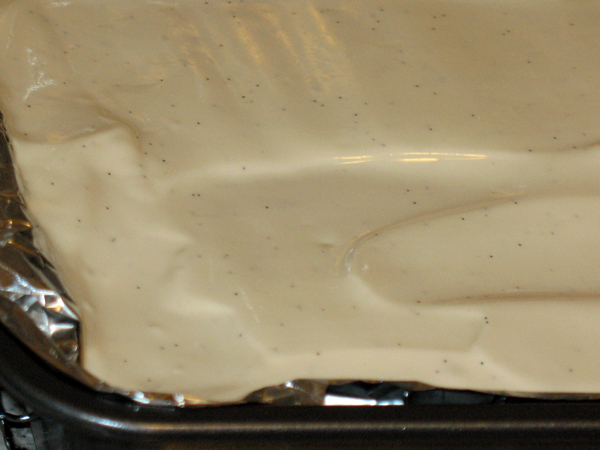 Step 1 – using centre rack, preheat oven to 176°C / 350°F. 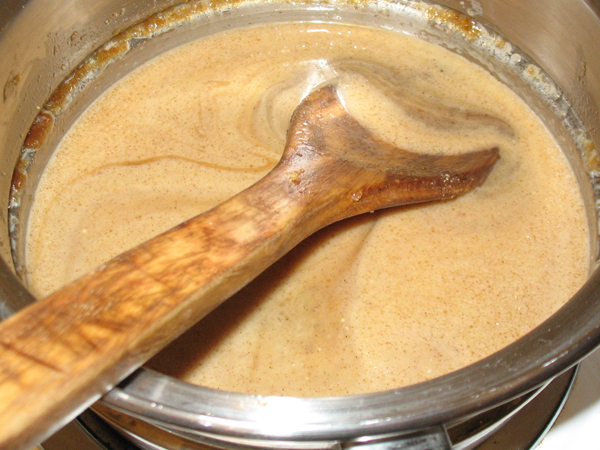 Fill kettle and boil. 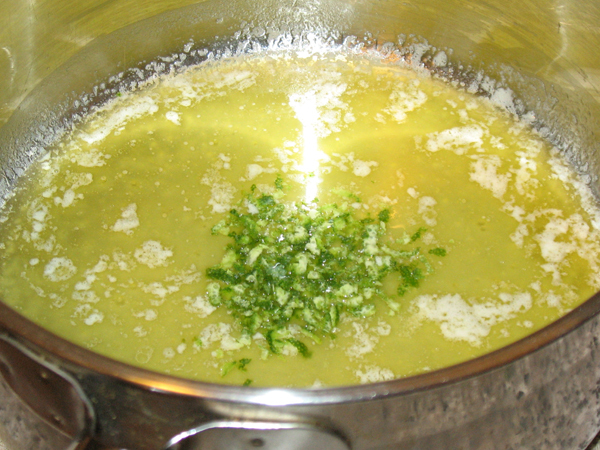 After water boils, leave on Low for use later. 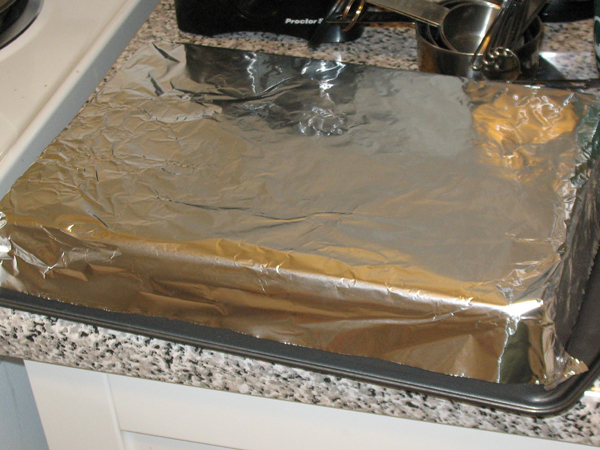 Step 2 – line 9″ x 13″ baking pan with foil, and grease the foil. 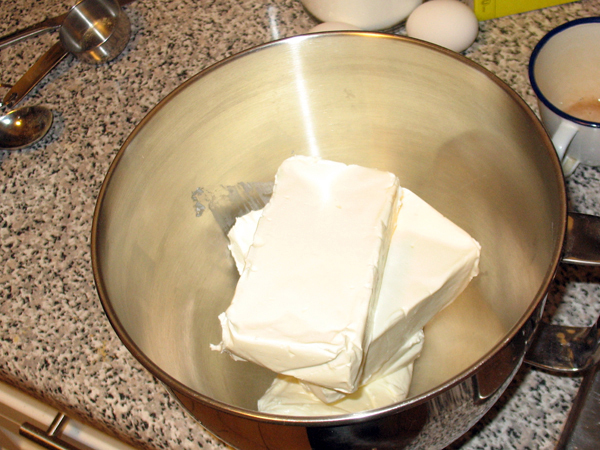 Step 3 – melt butter in sauce pan on Low. 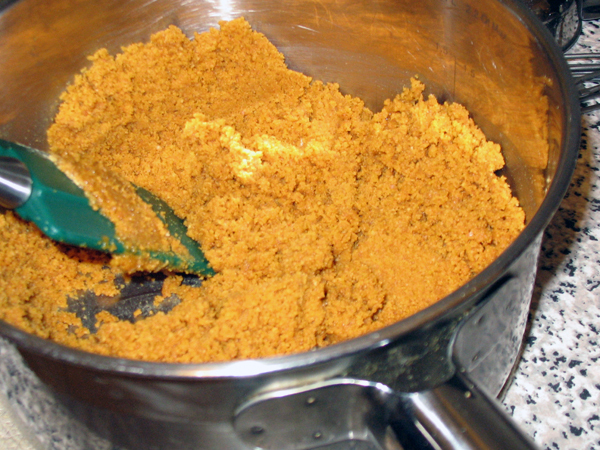 Step 4 – measure out the graham cracker crumbs and mix in the ginger. 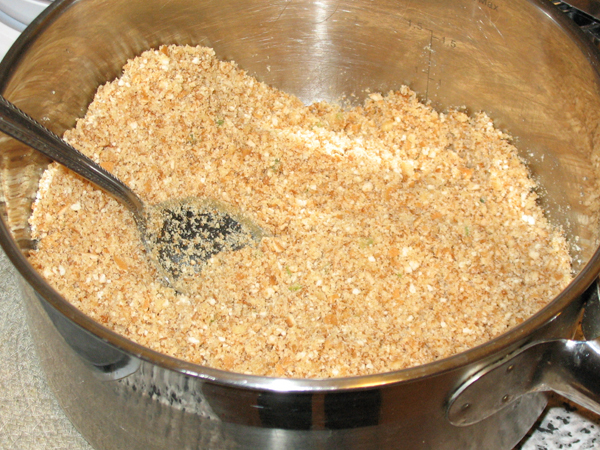 Step 5 – stir graham crumbs into butter and remove from heat. 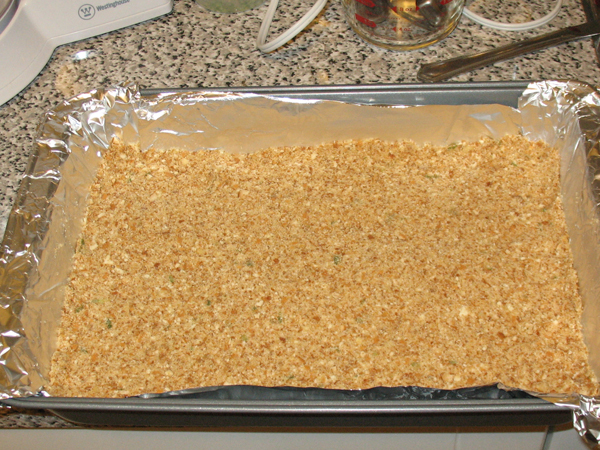 Step 6 – press the crumbs into the prepared pan by hand and bake 10 min, then cool on rack. 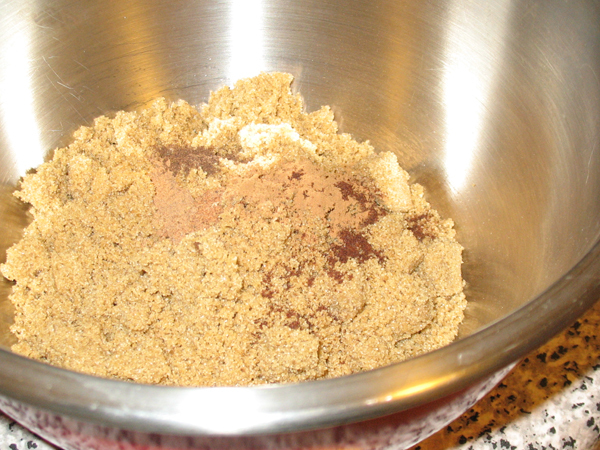 Step 7 – in a medium bowl, combine: brown sugar, cinnamon, cloves, pumpkin spice, allspice, nutmeg, ginger, and cornstarch. 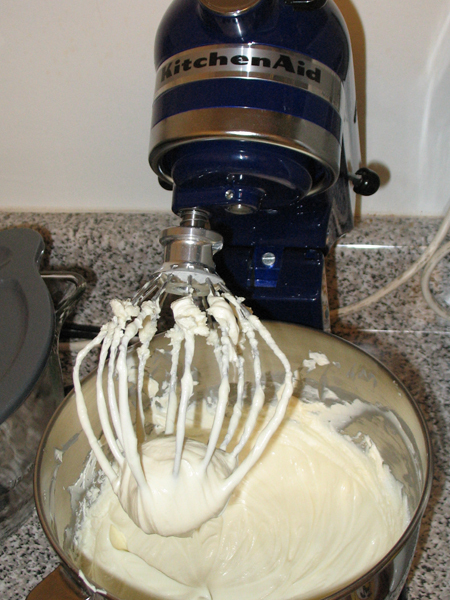 Step 8 – in mix master on Medium speed, beat cream cheese for 5 minutes. 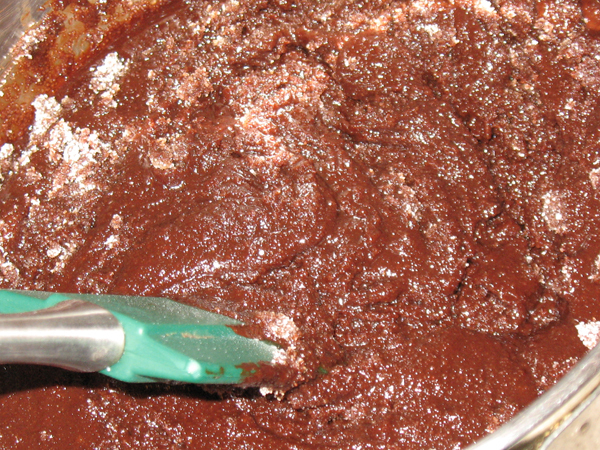 Use a rubber spatula to scrape down the sides of the bowl constantly. 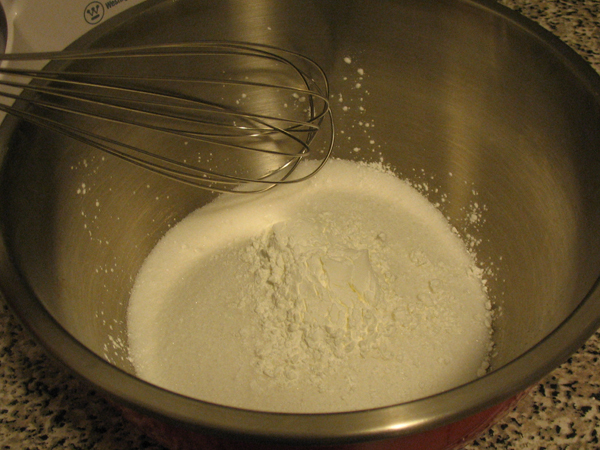 Step 9 – once the cream cheese is beaten up, stir in the sugar mixture, one third at a time. 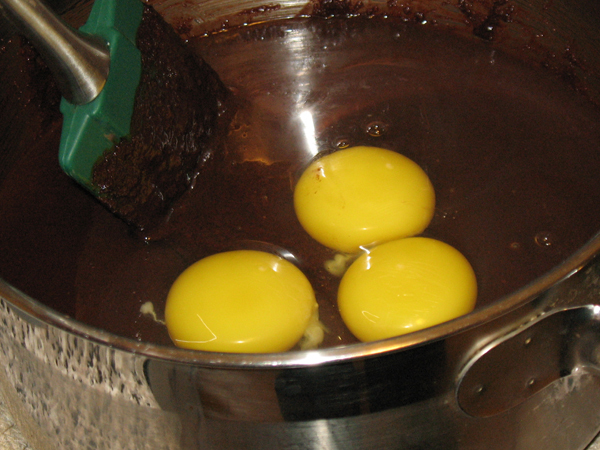 Step 10 – beat in the eggs, one at a time, don’t over beat. 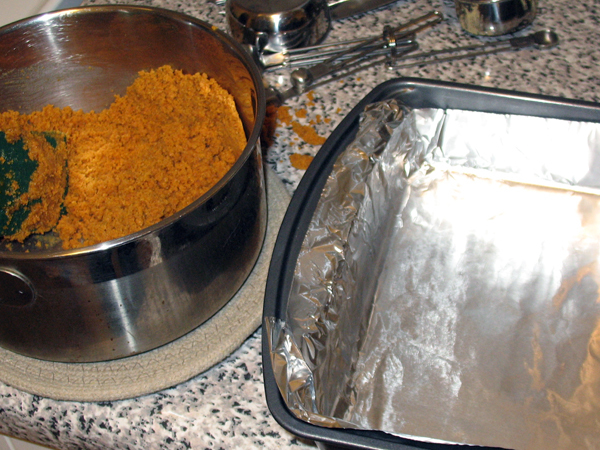 Step 11 – beat in pumpkin filling. 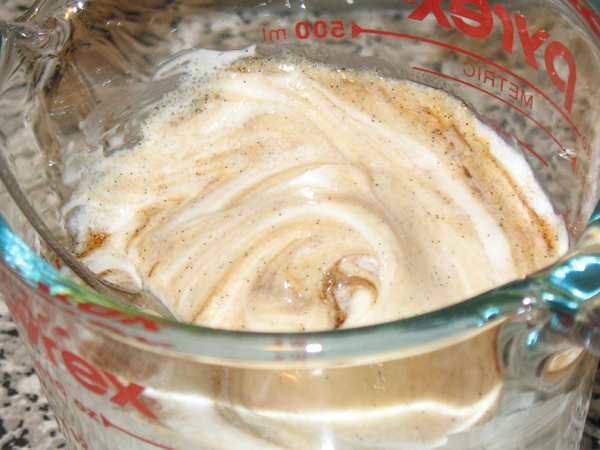 Step 12 – stir vanilla bean paste into heavy cream, the add to cream cheese. 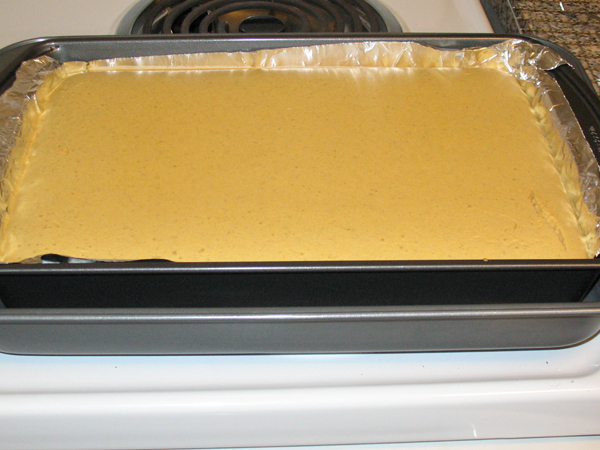 Step 13 – pour into prepared pan, and place that pan inside the large baking pan. 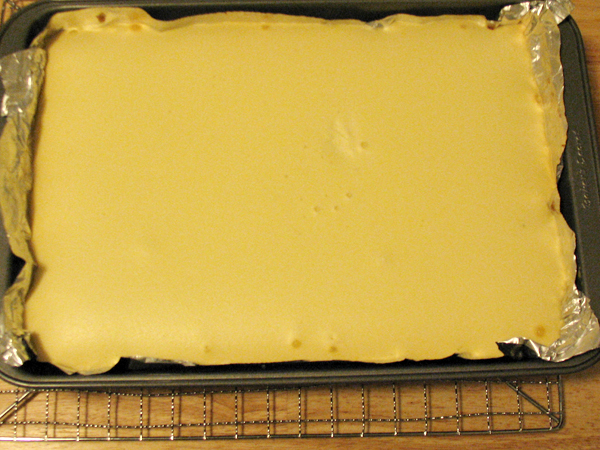 Using the hot water from the kettle, pour water into the outside pan so it rises about halfway up the side of the pan containing the cheesecake. 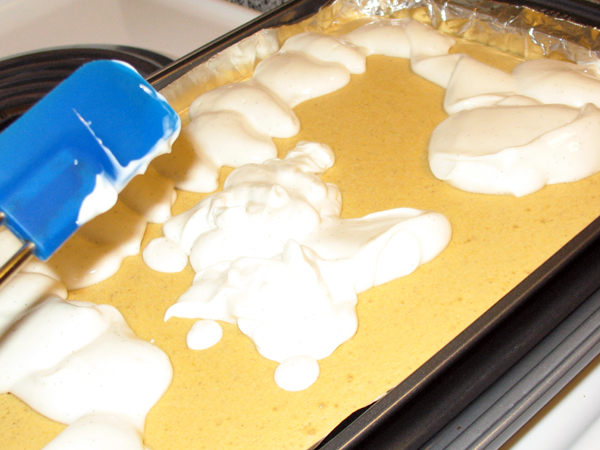 Bake in oven 50 minutes. 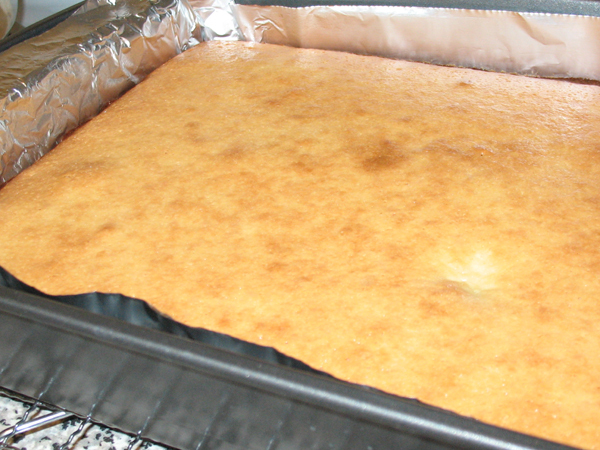 When you remove cake from oven, turn oven off. 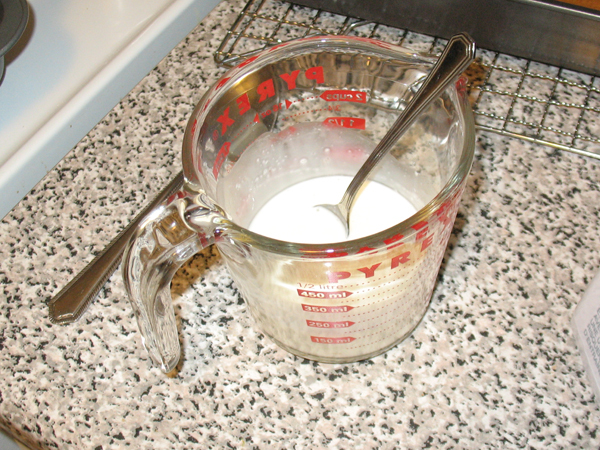 Step 14 – in a small bowl or measuring cup, mix together sour cream, sugar, and vanilla bean paste to create topping. See the little black flecks? 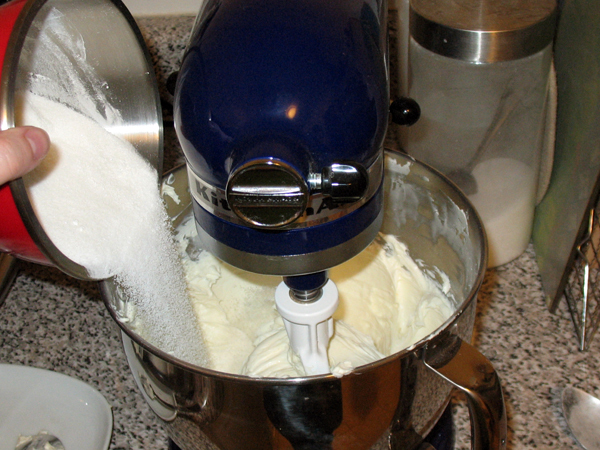 Those are the pods from the vanilla bean. 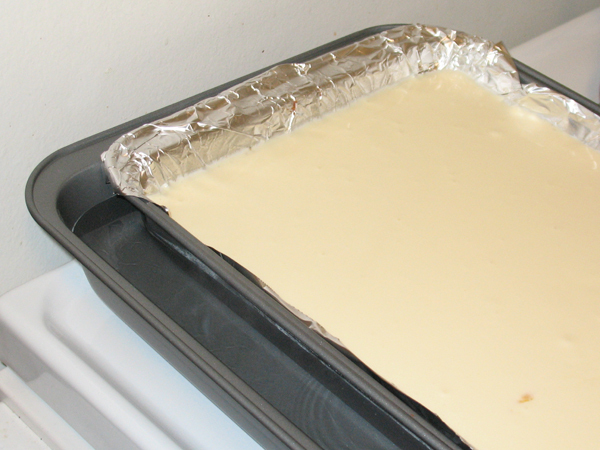 Step 15 – place this back into the oven for 5 minutes (oven is off). 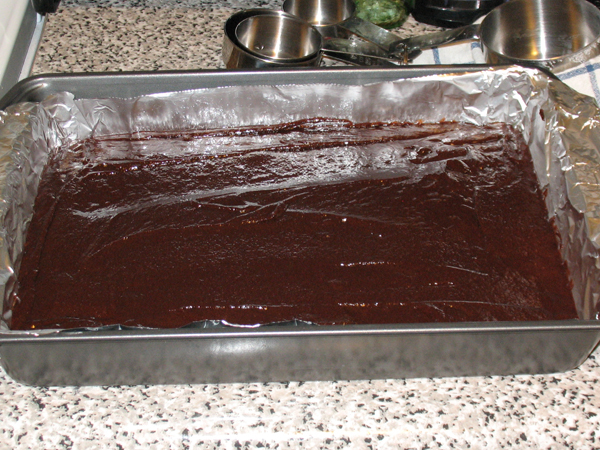 Step 16 – cool on rack for 2 hours, then cover with plastic wrap and refrigerate overnight. 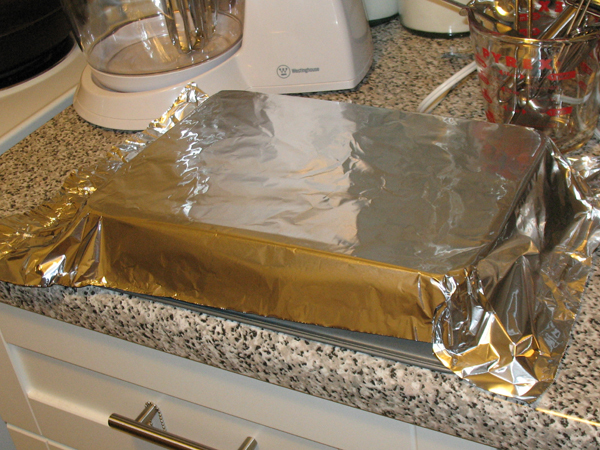 Step 17 – in the morning use the tinfoil to lift the cake out of the pan. 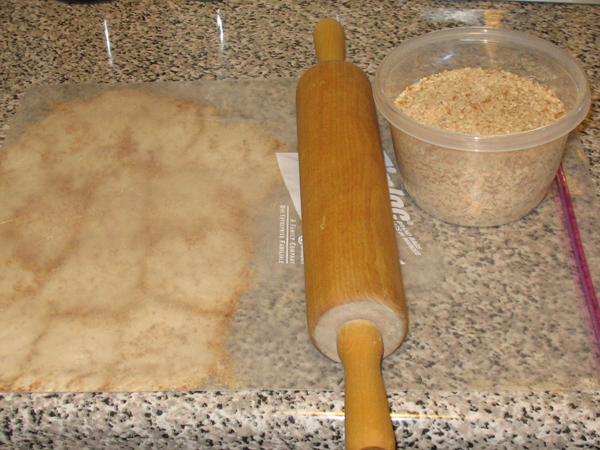 Use a hot knife and cut it into 8 or 9 strips, and then cut each strip into 5 or 6 pieces. 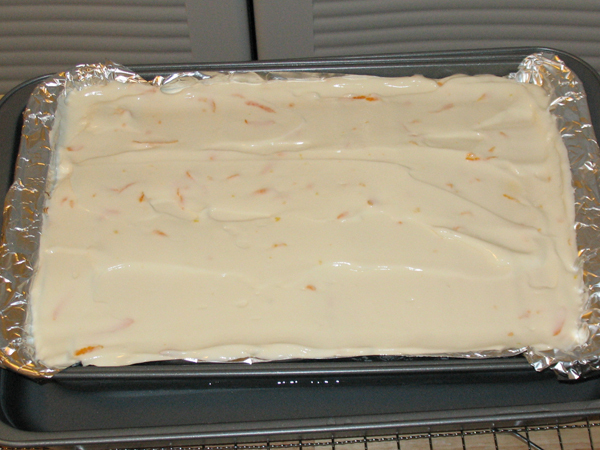 Step 18 – let pieces sit at room temperature for 20 minutes before consuming. I’m famous! SpatulaGoddess in a restaurant near you! 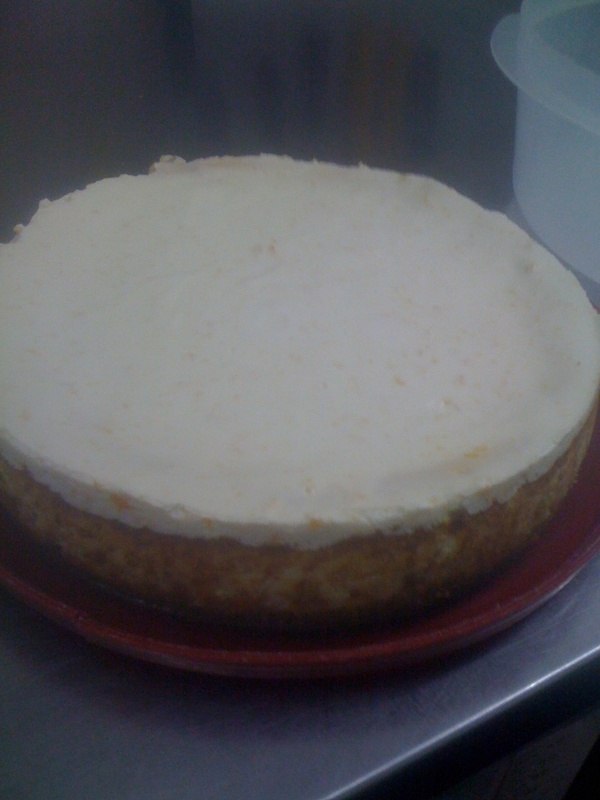 My citrus cheesecake is the featured dessert at The Old Triangle Irish Alehouse this week in Moncton!! The restaurant is located at 751 Main Street, downtown Moncton, NB, E1C 1E5, and opens at 11am daily. If you’re in the area check it out! I found out a few minutes ago. So cool. I love the Maritimes! 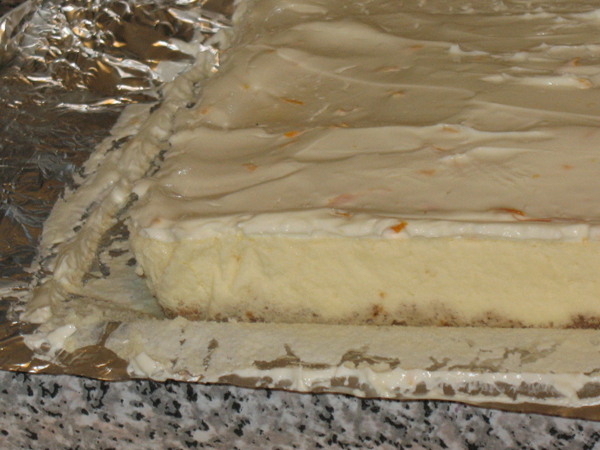 Last night marked my 2nd venture into Cheesecake Territory, to make a creamy filling with tangy citrus fruits, on a bed of vanilla crumbs, topped with a hint of sour cream. 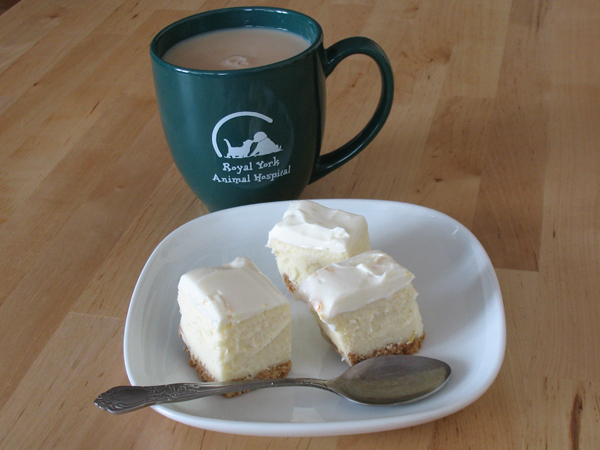 I ate a piece this morning with my cup of tea, and oh my!! 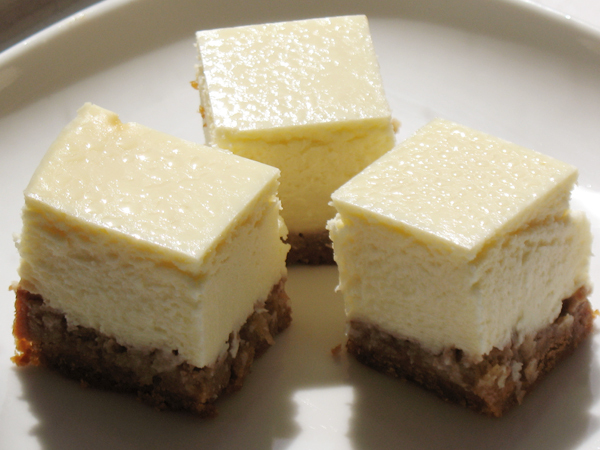 Food for thought: did you know that cheesecake originated in Ancient Greece over 4,000 years ago, and that the citrus fruit comes from Southeast Asia? 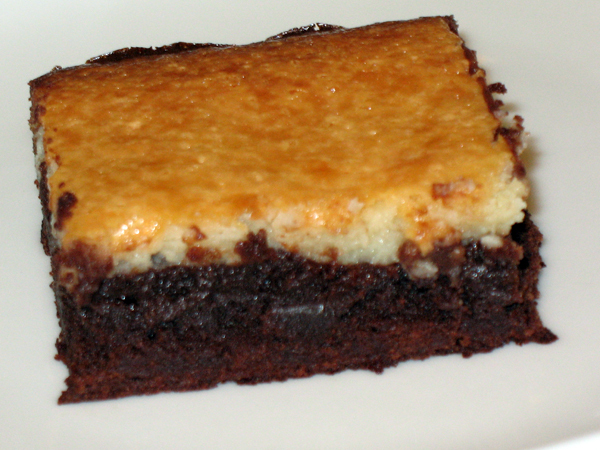 I found a recipe for “lemony cheesecake bites ” in Good Housekeeping Brownies: favourite recipes for Blondies, Bars & Brownies, which is available on Amazon.com and Amazon.ca. 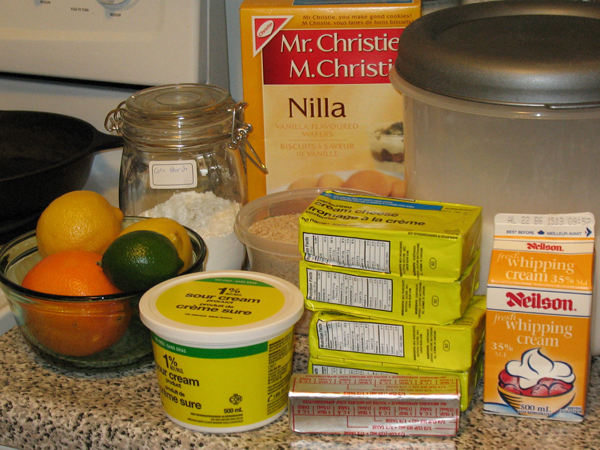 The recipe title is misleading since it contains lemon, lime, and orange, hence the rename above. I love citrus fruits. Everything about them appeals to me as an artist; the pleasing round shapes, the colourful peels, the juicy fruits inside, the range of flavours from sweet to tart, and the scent that rises as you open them. 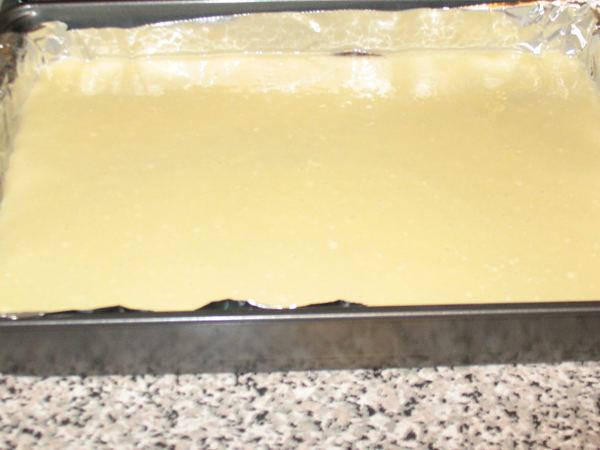 The possibilities; lemon tarts, lemonade, lemon gin, lime Thai, freshly squeezed orange juice…. and they ward off scurvy, too! Let’s hear it for citrus. 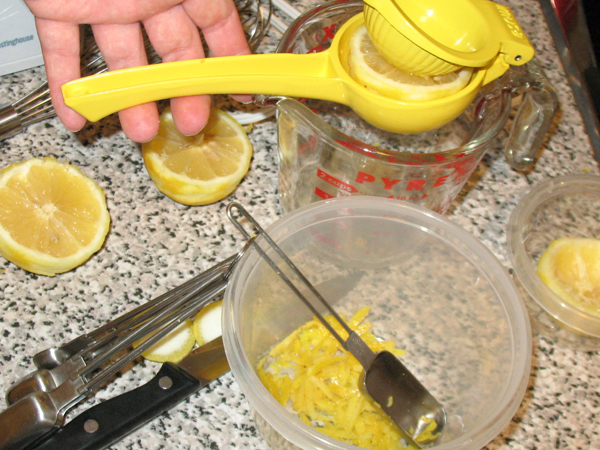 Step 10 – from lemons, grate peel and set aside, then squeeze juice and set aside. 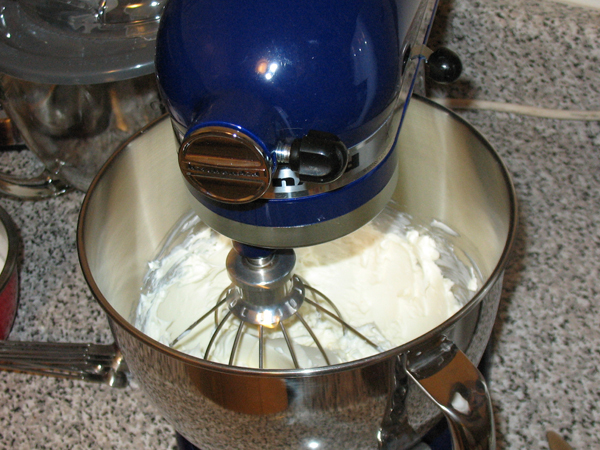 Step 12 – in mix master or large bowl, on Medium speed, beat cream cheese for 5 minutes. 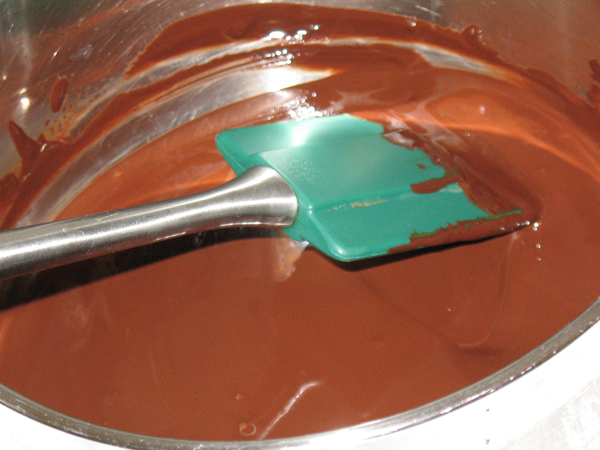 Use a flexible rubber spatula to scrape down the sides of the bowl constantly. 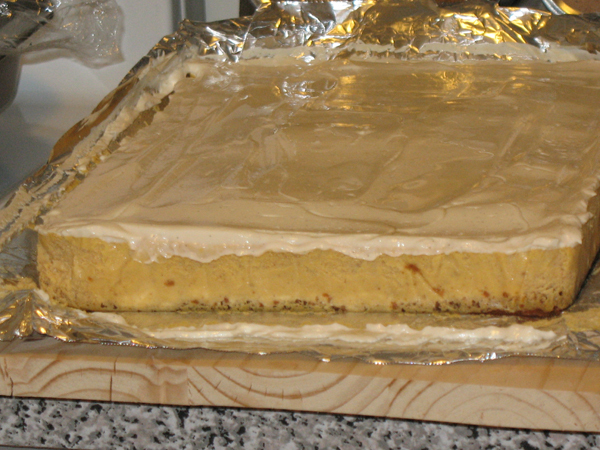 Already I am impressed with the texture, looking much better than the previous attempt. 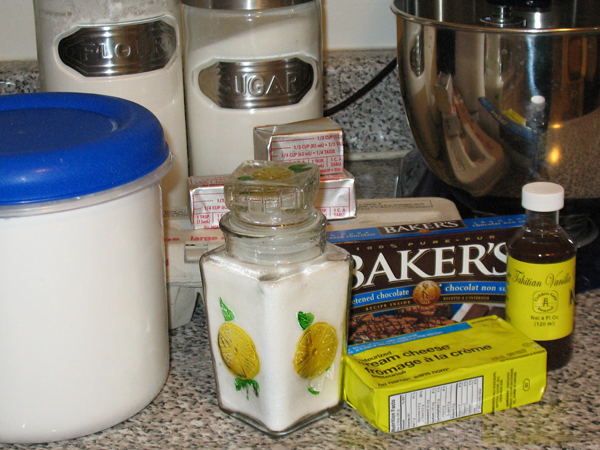 Step 13: one by one, beat in the sugar mix (adding a third at a time), followed by heavy cream, lemon juice, and lemon peel. 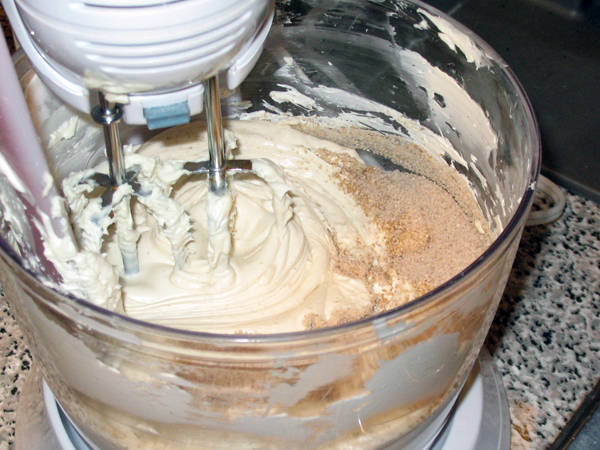 It is important to make sure each ingredient is blended well before adding the next. Keep scraping down the sides. 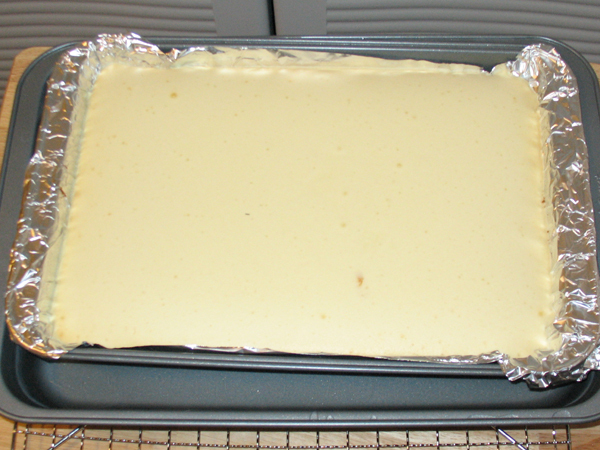 Step 15 – pour filling onto crust, and place 9″ x 13″ pan inside 14.5″ x 10″ baking pan, to form water bath. 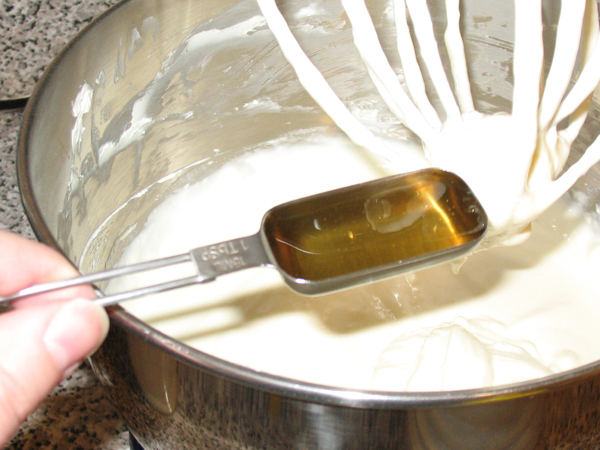 Carefully pour hot water from the kettle into the larger pan, it should rise about halfway up the side of the small pan. 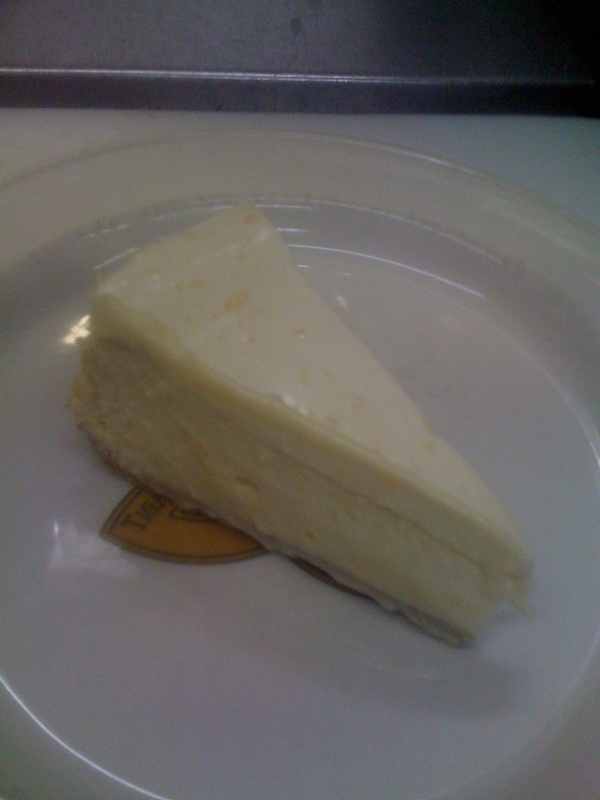 Verdict: citrus cheesecake is delicious. I am really pleased with how this turned out. 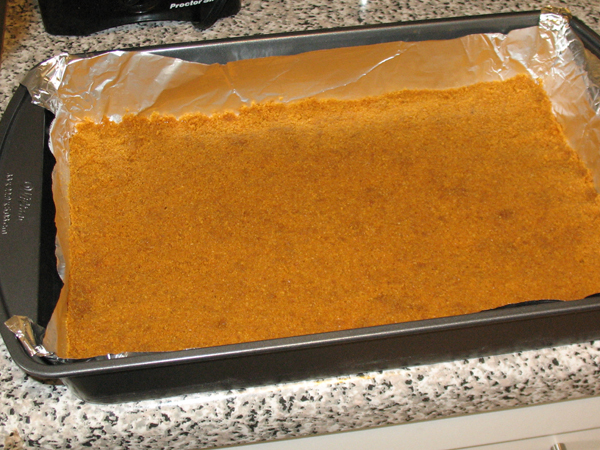 It smells (and tastes) amazing. 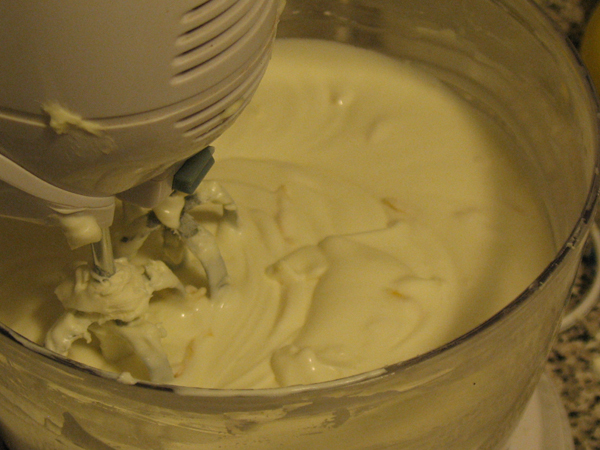 Although the lemon is the first flavour you notice, after taking a bite and letting it sit in your mouth, you’ll taste the lime and orange, set off perfectly by the sour cream. I think I’m in love. Glad I opted to use freshly squeezed fruits instead of bottled juice. 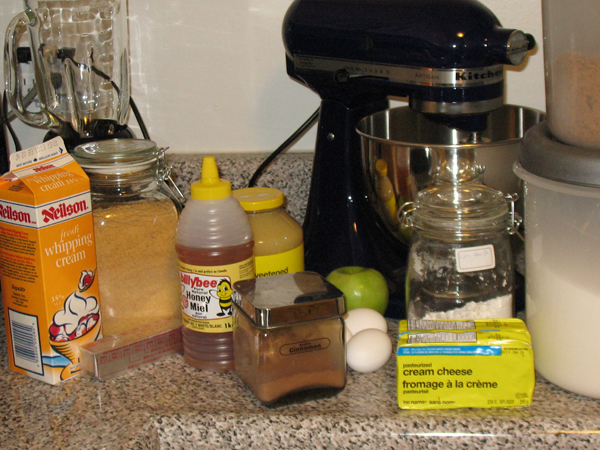 It took longer to make than anticipated but I forgot to time myself.